Download the Cruise Report . Download Brent Wheelock's thesis. Offshore MT sites collect during Nov 2008-January 2009. Deep-towed CSEM data were also acquired along the entire offshore profile. Dots on land show the extensive MT data acquired by GFZ-Potsdam duing 2005-2008. This research project aims to study the deep structure of the offshore section of the Pacific-North American plate boundary using controlled source EM and magnetotelluric soundings. It is an international collaboration between the Marine EM Laboratory at Scripps Institution of Oceanography, the magnetotelluric group at GFZ, Potzdam (Michael Becken, Oliver Ritter and Ute Weckmann) and the US Geological Survey (Paul Bedrosian). Our colleagues have been carrying out land MT measurements over the San Andreas Fault from 2005 to the present day, but ran up against an obstacle called the coastline. 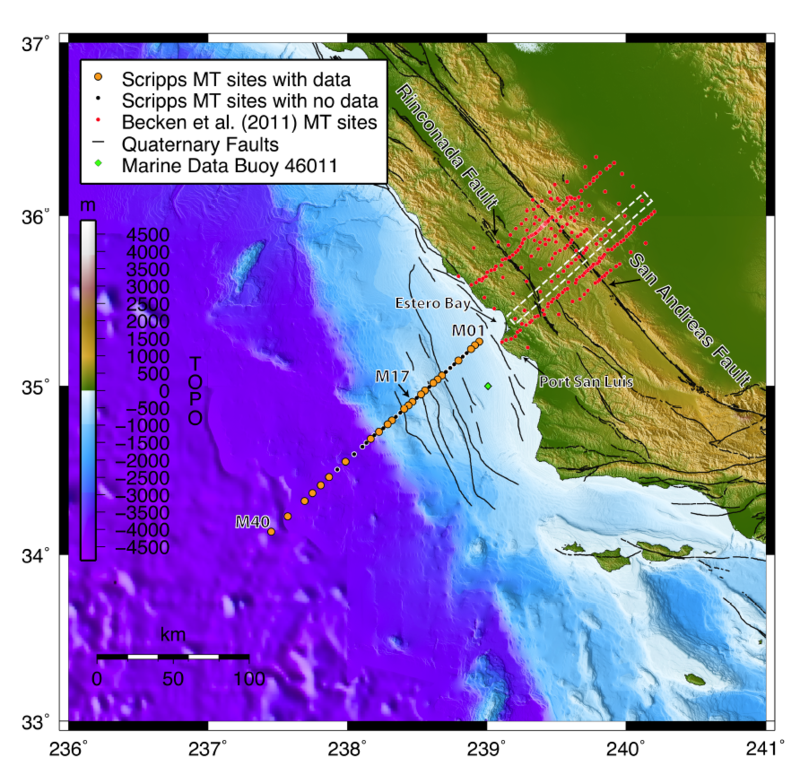 Modeling shows that important parts of the San Andreas Fault structure can only be fully imaged by extending the MT array offshore, and so we are going to do this in the latter half of 2008. The data will form the main part of Brent Wheelock's Ph.D. thesis. We are funding the project from a combination of UCSD/Scripps Institutional Shiptime and discretionaly funds associated with our industry activities.